Sound the alarm! Branden and I found an awesome “takeout” restaurant in Chicago. I put the term takeout in quotes because its only takeout if you truly don’t want to eat it there- if you actually want to sit down, you’ll wait a good hour to do so because the line is so long. You might be asking if its really worth it for food. Allow me to answer that for you: YES! XOCO. This is famous chef Rick Bayless’ attempt at Mexican takeout (just one of three restaurants he has in Chicago all in the same block). What drew me to XOCO as we were passing by was the fact that fresh empanadas were being made in the front window. Love at first sight. What could make this place even better? They roast their own cocoa beans on sight for chocolately drinks. This is serious Mexican street food. 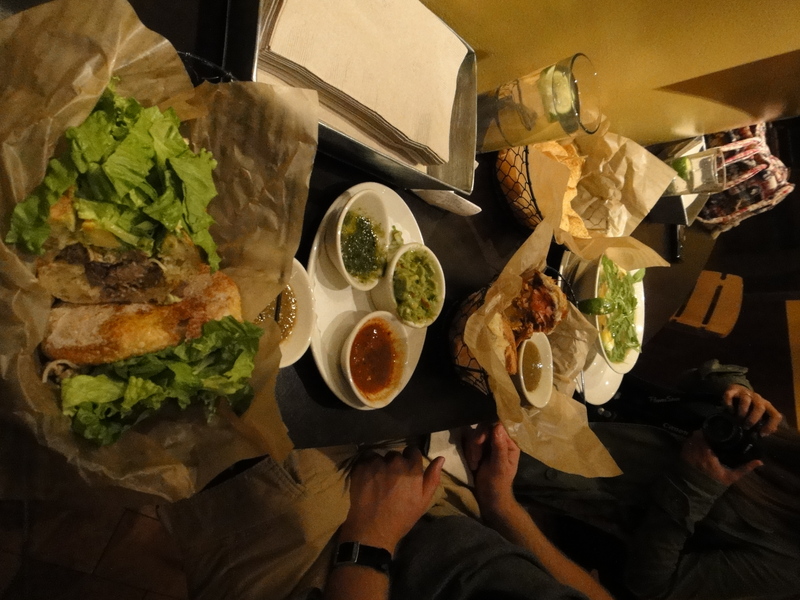 For lunch and dinner, they specialize in tortas (Mexican sub sandwiches) and caldos (“meal-in-a-bowl” soups). They also have a couple salads, but really who’s interested in that when you can have a sandwich that was toasted in a wood-fired oven? Yes, they toast their tortas in a wood-fired oven. This place just kept getting better and better! The bottom of the picture is my torta. I had the summer special that consisted of skirt steak, a fresh cabbage slaw, lettuce, and avocado. It was incredible and the flavors were fresh and vibrant. Next up from the bottom, you can see the order of guac and fresh salsas that we ordered. Branden and I can’t eat Mexican without chips and salsa…I think there’s some rule about the fact the two go hand-in-hand somewhere. Then there’s Branden’s torta, the Pibil: wood-roasted suckling pig with achiote, black beans, pickled onion, habanero salsa. Holy yum! This thing was amazing and I’d be hard pressed not to order it if we went back. My little sister ordered a caldo (seen at the top), Carnitas: Slow-cooked pork carnitas, potato-masa dumplings, chayote, roasted serrano chile, greens, arugula, avocado. This was also delicious and HUGE. Soup is definitely an entree at XOCO. After our meal, I insisted that we order some churros because I had been seeing them carried out all evening and they looked awesome. I was not disappointed at all! We ordered ours with a side of homemade ice cream (yes, they had homemade ice cream, too!) to dip them in which was an excellent choice. The churros came out so piping hot that I burnt my fingers on them. The pain we must suffer to enjoy good food I guess! The churros were probably the best I’ve ever had at a restaurant. Seriously. Bottom line, if you’re looking for some fabulous Mexican street food in Chicago and don’t mind waiting in a line, check out XOCO. While I didn’t get to try any other of Rick’s restaurants, based on my experience at XOCO, I’m willing to bet that they’re pretty awesome as well! Tell me about it! Its been fun, but I’m getting tired!! Looks like this month, everyone is coming to visit us, so I’ll hopefully balance out all those restaurants with some good cooking. Speaking of, I think I may try the Sangria you posted last week…or the Orange Marm cookies…decisions, decisions!